With Oasis blasting on the soundtrack, the V.Rom show last night reminded me of a Paul Smith collection. 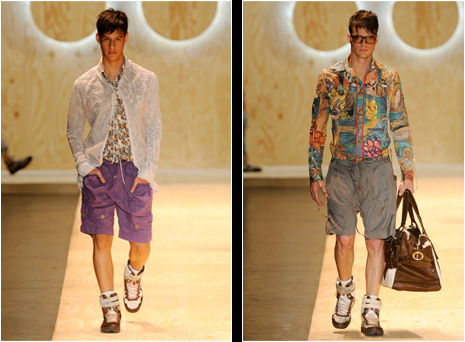 There were liberty prints galore, paisleys, Panama hats, and a bit of a British attitude with a fun Brazilian twist. Designer Igor de Barros failed to bring something new to the table this season, he succeeded in offering a large selection of pretty cool pieces for the boys to wear this summer after a day on the beach. I hope that the printed shorts will finally make their way to the stores this spring, as they are usually made just for the runway. Large pictures and video after the jump. This collection I don't see anything British about it. I guess I should have posted more pictures. Muito obrigado pelos fotos em alta resolucao. MADE IN BRAZIL, voce tem razao, should've posted more. 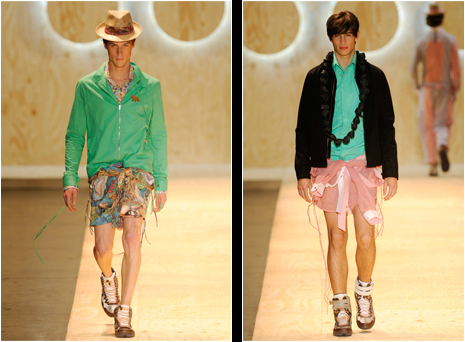 I always liked V.ROM, more than ever I understand Rio and Sao Paulo fashion. Nao tenho mais que estar a espera de fotos.